On Palm Sunday we went to Massada and to the Dead Sea. 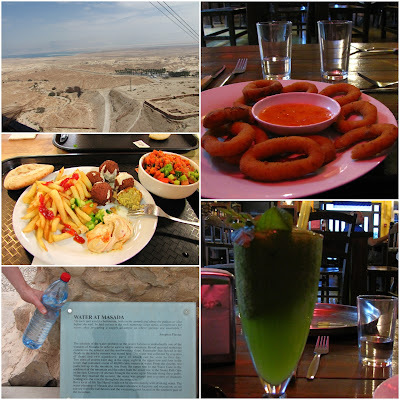 After we were hiking the path from the top of Massada to the entrance hall, we were so sungry that we had some falafel, chips, humus, vegetables and pitot in the restaurant down there. We went in two cars and before we split on the way to Jerusalem and Tel Aviv, we had a farewell meeting in a small restaurant/bar in the desert which is called "LAST CHANCE". The girls had some coctails and some other food.